This might be one of my favorite Ipsy bags yet! It came this morning in a cute plastic bag decorated in little ice cream cones. I think I'll give it to my sister, who used to work in an ice cream store. The actual products are really nice, too, and I'll definitely use each one! I'm a tad disappointed in this because I know another option was Posh, which has been on my wishlist for ages, but I've been dying to try this New Zealand brand for ages so I'm glad to get a full-size lipstick in a wearable color. These are $13 each, so it is already worth the price of the bag. I usually don't like tinted face products from subscription bags because they don't match, but this one looks just light enough for me! I would prefer something with more coverage, but this will be nice for lifeguarding or for beach days if I want to look nice. 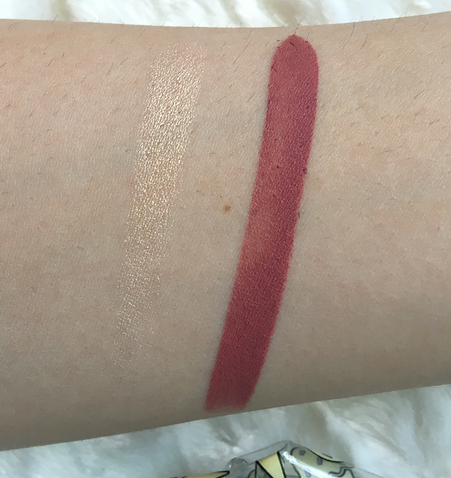 This was love at first swatch for me. I don't know why I've always overlooked this highlighter, I guess it always seemed really pink in photos. It's more of a pearlescent pinky-champagne shade. It's very pigmented, smooth, and metallic, and you actually get a good sized sample. I've heard great things about this mascara on YouTube so I can't wait to try it! The brush doesn't look like anything special, it's a spiral shape bristle wand. I will give any mascara a try and I love getting samples of higher-end ones. My hair is very damaged after nine years of competitive swimming, so moisturizing hair products are my favorites. I loved the Briogeo leave-in mask so I have high hopes for this, too. It comes in a pump and the sample should last me a long time. Overall I'm so happy with the bag this month. The products are probably worth double or triple the amount of the bag's cost and I recognize and like each brand in it. Have you tried any of these products? Would you be excited about any of them? 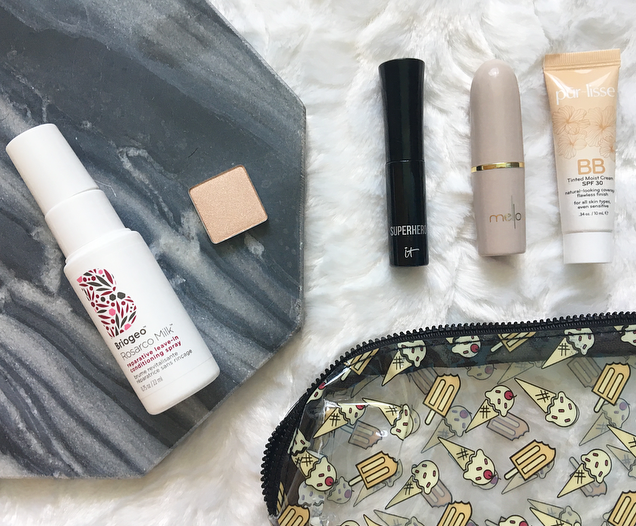 7 comments on "May Ipsy Bag Review"
You got so many great looking things! I love the Superhero mascara. I have the Posh lipstick and I despise it. It does nothing for my skin tone except make me look dead. I wish I had the Urban Decay highlighter, but I did get the Manna Kadar bronzer/highlighter duo. This looks like a great bag! ooh the Sin sample looks great! Love the look of the lip shade too but its always disappointing when you wanted the other shade option! Antihaul #2: What I'm Not Gonna Buy! Tarte Shape Tape Concealer: Worth the Hype?